In 1651, as the works for the impressive new Pamphili residence came to a close, Innocent X turned to a new plan, for reconstruction of the ancient church of Sant’Agnese, also situated on Piazza Navona, immediately adjacent to the Pamphili palazzo. 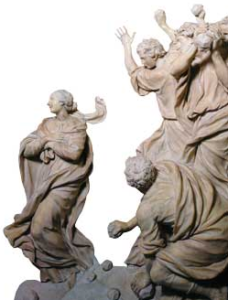 The commission was awarded to the architect Girolamo Rainaldi, who initiated works on 15 August 1652. The demolition of the old oratory of Saint Agnes was begun on 3 September of the same year. Rainaldi, who directed the project with his son Carlo, designed a structure in Greek-cross plan, supporting a cupola without drum. The square central mass had large niches in the pilasters at the cross-corners and was to be preceded by a vestibule. The facade and two lateral towers were essentially rectangular in form, with grand steps descending to the piazza. In 1653 the pontifice removed Rainaldi from the works, which were already well advanced, and assigned the project to Francesco Borromini, who eliminated the planned vestibule and began construction of two low bell-towers at either side of the facade, maintaining a clear view of the cupola. The plan was that the cupola would now be raised on a drum, culminating in a lantern flanked by 16 columns. With the death of Innocent X in January 1655, his successor Alexander VII appointed a committee for the investigation of Borromini’s supposed errors. Relations between the architect and committee soon soured, and the architect eventually abandoned the Sant’Agnese works. By this time the central part of the facade was probably complete, including the massive lintels, while only the foundations of the lateral towers were installed and the upper pediment with lunette was still missing, as well as the cupola lantern. 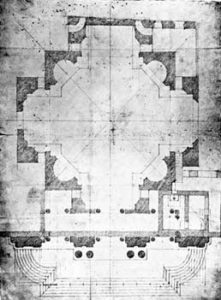 At this point Carlo Rainaldi was called back to finish the work and in turn revised the Borromini plans, particularly in the design of the lantern and bell-towers ‒ in so doing deleting all the fantasy expressed by his immediate predecessor. In 1667, Donna Olimpia Maidalchini, widow of the brother of Innocent X, engaged Gian Lorenzo Bernini for supervision of the final interior decorations. 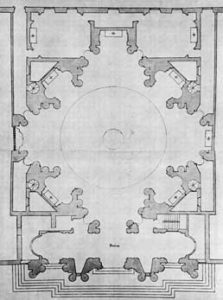 These proceeded with only minor changes from Borromini’s plans. It was also at this time that Giovanni Maria Baratta constructed the bell-towers, while his brother Giuseppe Baratta completed the grand entrance steps.